That little guy that you’re looking at to the left is a clove of garlic. If you break up a head of garlic, you get lots of smaller cloves. 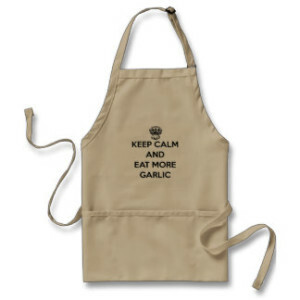 Most garlic recipes call for a few garlic cloves, typically two or three. When you buy garlic, you’re buying a head of garlic. If you break that up, it’ll come apart in segments that still have skin and wrapping on them. Each of those segments is a garlic clove. Very few recipes other than roasted garlic call for you to cook the the entire head of garlic at one time. When cooking with garlic, you’re almost always using just a few cloves from the head or bulb. 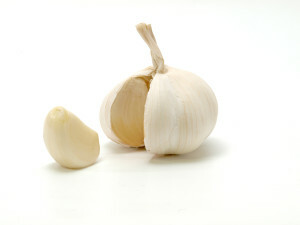 A head of garlic (also called a bulb) is shown to the right, with one of its cloves pulled away and peeled. If you’re new to cooking with garlic it’s very common to get confused as to what is a clove of garlic and what a head of garlic is. A clove of garlic will go a long way in most dishes. Chopping up a clove or two may not produce an impressive pile but garlic packs a potent punch. Don’t be fooled by its small size and assume that the recipe really meant for you to chop up two heads of garlic as that’d be far too much, even for many diehard garlic fans. 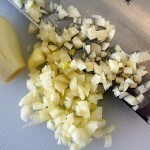 Compared to many other vegetables that you chop and use in recipes, you’ll be using a very small amount of garlic. How Many Cloves are in a Head of Garlic? The number of cloves in a head of garlic depends on the variety, and can range from as few as four or five cloves up to thirty or more cloves for other garlic varieties. As far as typical garlic that you find on supermarket shelves, you’ll most commonly be buying a garlic variety called California Late that usually has 10-15 cloves. The number of cloves isn’t exact, even for the same variety. One plant from a variety might have 10 cloves while a neighboring plant of the same exact variety might have 15. How you’ll be using the garlic in your recipe also dictates just how much garlic you’ll really need to chop, mince, or crush in a garlic press. 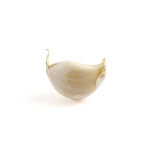 Raw garlic is very strong and intense, so any dish calling for raw garlic will usually call for just a clove or two. Roasted or baked garlic will call for much more — sometimes 40 cloves or more for some baked dishes — as baking or roasting garlic will cause the flavor to mellow and be much less intense.